In this article, we share some out-of-the-box ideas you may not have considered. Remember, your mortgage broker can assist with finance for all different types of property investments, including those with a twist. Prices for car parking spaces vary. However, generally speaking, they tend to range from $40,000 to $130,000 in inner-city locations (sources: www.findacarpark.com.au and https://www.commercialrealestate.com.au). To give you an idea of the returns, a lock-up garage parking space in Lonsdale St, Melbourne, could bring in $922 a month. Likewise, a secure car space on Clarence Street, Sydney, could rent for $1018 a month (source: www.spacer.com.au). Make sure there are no restrictions about renting out the space before proceeding. Another example is this former brewery turned boxing gym, school, military drill hall, Masonic lodge, girl guides hall, antiques shop, and café in Campbell Town, TAS. It could be yours for $800,000 and has potential for a creative developer. On the other end of the price range is this former Masonic lodge in Woomelang, VIC, available for a mere $49,000. If you’ve fallen in love with the tiny house craze, you may like to look for a smaller property. This former Anglican church, for example, offers plenty of charm in Kempsey NSW. Be sure to factor the costs of converting the property into your budget. Keep in mind you’ll require a commercial loan rather than a residential one, which may come with a higher interest rate and shorter loan term. 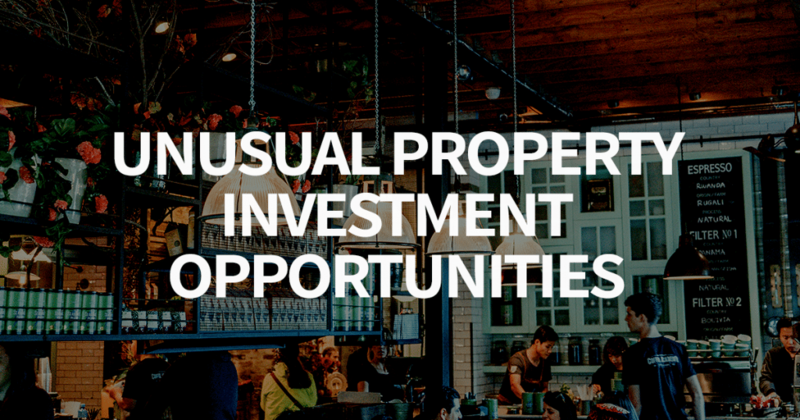 If you have an idea for an unusual property investment, it’s important to talk to your mortgage broker early on. They’ll look at the numbers and help you decide which type of finance is right for you. Remember, your broker can offer advice on all types of loans for property investment, so please get in touch.